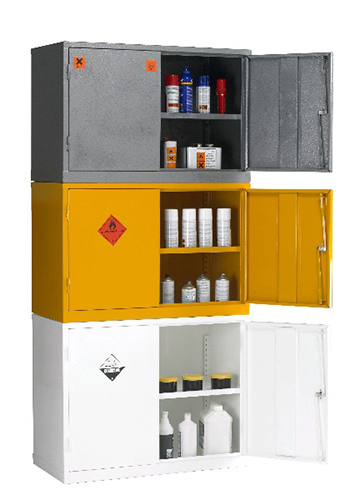 For Areas with limited floor space, multi substance cabinets can store Flammable, Acid, and Liquid Chemicals but only take up the space of one cabinet. Cabinets should only be stacked to a maximum of 3 units high, and Acids should only ever be stored in the bottom cabinet. Cabinets are finished in white polyester powder coat for Acids, grey epoxy powder coat for CoSHH and yellow epoxy powder coat for Flammables. Comes with: 1 shelf, Sump height of 50mm, 2 doors. Comes with: 1 shelf, Sump height of 50mm, 2 door.